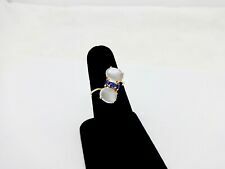 Oh so pretty 14k solid gold double cabochon Moonstone and blue sapphire ring. The size is a 6 and the ring weighs 3.8 grams. The top of the ring is 18mm(11/16") x 8mm(5/16"). The stones show very nice color. TOTAL LENGTH 2 1/2 " BY 1" WIDE. THE STONES HAVE A ROLLING BLUE IRRIDESCENCE. 5MM BY 7MM. TOGETHER WEIGH 8.2 GRAMS. LOOK AT THE CONDITION. A PICTURE IS WORTH A THOUSAND WORDS. She’ll admire the sophisticated style of these stunning gemstone lavaliere. Moonstones are beautiful gems that have a history of spirituality and magic. What gives moonstone its eerie, moon-like glow is the crystal formation within the stone. Offered for sale is a sterling ring with a large moonstone. The ring top is 9/16" wide, size 9 and 8.6 grams. Signed 925. Very good condition. Vintage Sterling Silver Moonstone Amethyst Lavaliere Necklace 19"
Vintage Estate Sterling Silver Moonstone Bracelet ~ 7 1/2"
In wearable condition, one moonstone has a tiny chip on the edge. I have not cleaned or polished this piece, it is estate fresh. Metal Purity: .925 Sterling Silver Size: 8 Top: 12mm (approx.) Band: 10mm (approx.) Weight: 10g . Metal Purity: .925 Sterling Silver Size: 6 Top: 11mm (approx.) Band: 4mm (approx.) Weight: 6g . Stone(s) Hematite. Material Sterling silver. Markings STERLING. That being said, mistakes can occur. # of Pieces 2. Five bezel set moonstone colored glass cabochons. Marked: WRE Sterling. The Item Pictured Is The Item You Will Receive. Metal Purity: .925 Sterling Silver Size: 13.5 Top: 25mm (approx.) Band: 3mm (approx.) Weight: 13g . White square cut moonstone in a silvertone setting surrounded by clear rhinestones going down the side of the band. Did not see any makers markings. Oval Shaped Ring. Size 7.0Weight 6.88 G SR1550. Metal Purity: .925 Sterling Silver Width: 15mm (approx.) Height: 40mm (approx.) Weight: 7g . Color: - Pink & hematite plate. Near the bottom is a swirled gray stone. The center of the necklace is 3 strands which are tiny pink & gray stones. She has been a serious collector & dealer for many years and still has a high end personal collection. Baby Blue Rhinestone Necklace. Hallmarked: Sterling & Makers Mark. We strive to take clear & accurate photos. We Do Not Hide Behind Dark or Poor Quality Pictures. So that we have the opportunity to resolve any issues you may have. VINTAGE Early Native American OLD Pawn Style Sterling and Moonstone? Ring. Vintage Sterling Moonstone 18" Pendant Necklace. Great Vintage Condition. Engraved on the inside and outside. 925 Sterling Silver - Vintage Oval Moonstone Solitaire Ring Size: 7 No return accepted! Thanks for looking! This beautiful necklace features an exquisite handmade 29" single strand design with a stunning combination of Czech Blue Swirl, Opalescent, & Flower Foil Art Glass Beads that would look amazing around your neck, in your collection, or would be a perfect gift!The. This ring is in very good condition. It is well rounded, the silver is clean, smooth, and bright, and the ring has no cracks or breaks in the surfaces of the silver or stone. The one flaw in this piece is that the stone seems to be very slightly off set in the mount. The necklace has a silver tone cable style chain on both sides towards the back. The center drop has a triangle made of clear round rhinestones. Wired over the top of the triangle are four teardrop shaped white faux moonstone cabochon with two clear round rhinestones on top of them. There are two red rhinestones for the eyes and they match each other. Vintage Large Blue Moonstone Cross Heavy Silver Pendant. Shipped with USPS First Class Package. Length of necklace is 16"and width of links is 1/2"and length of individual links is 1.5". Featuring gray Moonstone. Bright genuine white Moonstones in 925 sterling silver. 4.69 grams and it is about 1-1/8" long and 1/2" wide - an elongated oval with scrolled side panels in the shape of a heart. The band is 12mm wide at the top shoulders and tapers to 2mm at the back of the finger with a ridged recessed band. VINTAGE ARTISAN STERLING SILVER MOONSTONE CABACHON DROP NECKLACE 16"
BEAUTIFUL COLORFUL MOONSTONE GEMS MAKE. Vintage Sajen Red Hand Carved Cinnabar moonstone Sterling Silver Pendant Necklace The pendant is made of two pieces that have been welded together in a single stiff piece. Looks beautiful! See pictures for more details! 19” long No return accepted! Thanks for looking! Clip earrings are also silver tone with blue glass (not a set but work well together!). They are suspended on a delicate 5/8" goldtone chain. Size 7.75Weight 9.04 G SR1497. VINTAGE RHINESTONE OPALESCENT BLUE MOONSTONE BEADS FLOWER BASKET BROOCH. The brooch set with white rhinestone scatter over and blue moonstone looking beads as flowers. Very Cute Flower Basket Brooch. Keep checking back and you might find just what you are looking for. I am not sure if the stone is blue chalcedony, moonstone or glass! The style is very flowing- the rope edging, with the flower or leaf on the sides where attaches t band. All rings can be re sized by laser by my jeweler.